Punch Quest is a weird yet fun auto-run action game with RPG elements. This app Rocketcat Games and Madgarden is for the iPhone, iPod Touch, and the iPad. It requires iOS 4.3 or later and is optimized for the iPhone 5. This game is about upgrading your male or female character and most of all buying hats. By punching things, you earn punchos (in-game currency); they are used to get new moves, upgrades, hats or things you can wear on your face/head and one-use items (boosts). 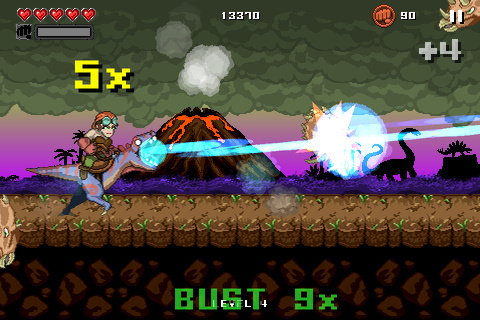 Something random (not exactly) I saw when I first played this game was seeing a laser spewing raptor that destroys floating triceratops heads. I like this random, action run game with more emphasis on the action compared to other games of this sort. By tapping the left side of the screen, your character (gonna call mine Punchy since it’s easier) will uppercut while tapping right will make him/her do a dash punch. Tapping left while in the air will make Punchy slam. Blocking is enabled when you buy it from the shop under upgrades, press and hold both sides of the screen, this can be changed under options. Uppercut is your jump so use it to dodge spikes and enemies/attacks or to the higher floor/platforms. I’m not sure but I think combos increase your score at the moment it stops and you start over until you die. Combos end when you pause or did not hit an enemy for a while or whenyou blocked an attack. There are two paths you take to fight a boss, get treasure, get a powerup, an egg, two new paths or something random. Sometimes, both paths are the same such as they both offer bosses. At the moment, punching an egg will turn you into a dinosaur or something else (I’ll let you find out what it is), the transformations are not random and you kill enemies that are not seen anywhere else in the game. You randomly get punchos by punching/killing things. Punchy’s levels resets when you play a new round, when you level up you get a half a heart back (health). 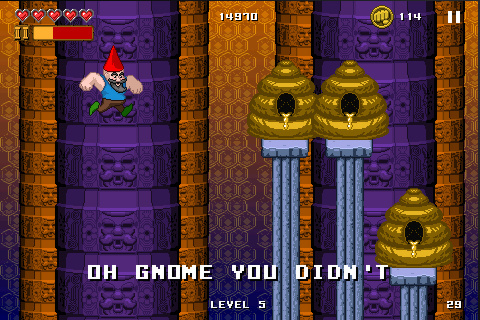 By doing quests, you level up a gnome and when you max him out, you get an ultrahat (it can be found under special). You can bring up to three abilities with you. Some are first unlocked by purchasing cheaper abilities and then you have to purchase the skills/moves themselves. Your moves are activated when they fill a certain amount of the meter. The upgrades section require you to buy hats (can’t be hair or face items but ultrahats count) to be unlocked and the last couple of them can be very expensive (200,000 punchos for the most expensive ones so far) but doable. You can bring as many as you bought. There are at least 4070 different idols (not counting various rarities such as bronze or gold) which when punched gives you punchos (I only have a little under 300 at the moment). The pause screen gnome says random yet sometimes helpful things (says something different if you rotate you device vertically or horizontally). Options feature cloud sync, block preferences, performance, rotation, Game Center, achievements, statistics, etc. The graphics are colorful with dark shades and detailed with minor pixilation if you are looking for it. You can customize your character’s colors such as skin tone, hair, hat and armor. Finding random things such as UFOs in the background, a realistic face among psychedelic heads as enemies, etc. are amusing the first time you see them. Some of your moves reference other games or shows such as using the uppercut when equipped with the grillin’ punch makes me think of Street Fighter’s Ken doing a fierce shoryuken and the ultra form of a super move is called Fist of the Gnome Star. Enemies can fall apart, fly across the screen when hit or fall off the stage when killed. On my last heart, I can see Punchy sweating. Rotate the screen and play it either vertically (see a bit more of the top of the screen) or horizontally (recommended). The audio is fine; everything sounds what they should like. The music can be boring but it changes slightly when certain things happen. I like the sound effects such as lightning zapping and enemies getting punched which hopefully means your combo is continuing. You can listen to podcasts again with the latest update. Even though the audio is reused, I like the variety and the way that it changes depending on what is happening such as getting activating an ultra move. Punch Quest is $0.99 on iTunes. There are numerous in-app purchases but they are not necessary to play the game. You can donate $0.99, buy Punchos for $1.99, $4.99, or $14.99, and purchase a punchos doubler for $2.99. Punchos can be used to skip quests (under Boosts) especially harder ones like beat 200 foes in one game. The latest update gives a new look for some abilities and fix some bugs. It made the drill punch move weird to use since it requires you to tap left for the hits to count for a quest. Punchy stops abruptly sometimes and ruins my combo or there is some lag but that could be my iPod Touch 4g (I set my performance to mid and it seems fine now). I would like a better source of info/tutorial and a way to tell I got a new idol (still don’t know what a true idol is, maybe I get it by finding all the rarities of that one). Here are some recommendations: buy all the upgrades that you can afford since you can bring any amount, buy the skills highercut, shieldbuster, the supermoves knuckle circle or thunderpunch and the moves/abilities the gnome suggests so you can complete quests. I’m having a blast(can’t think of a punching pun) with this game and am still trying to get all the moves and hats. AppSafari review of Punch Quest was written by Tony Lau on December 10th, 2012 and categorized under Action, App Store, Arcade, Featured, Games. Page viewed 5221 times, 2 so far today. Need help on using these apps? Please read the Help Page.